ODRL Information ModelThe Open Digital Rights Language (ODRL) is a policy expression language that provides a flexible and interoperable information model, vocabulary, and encoding mechanisms for representing statements about the usage of content and services. The ODRL Information Model describes the underlying concepts, entities, and relationships that form the foundational basis for the semantics of the ODRL policies. Policies are used to represent permitted and prohibited actions over a certain asset, as well as the obligations required to be met by stakeholders. In addition, policies may be limited by constraints (e.g., temporal or spatial constraints) and duties (e.g., payments) may be imposed on permissions. ODRL Vocabulary & ExpressionThe ODRL Vocabulary and Expression describes the terms used in ODRL policies and how to encode them. 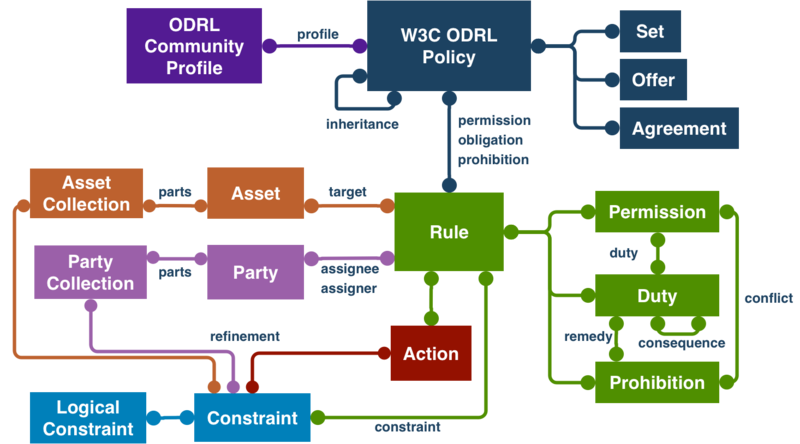 Please read more in the W3C Blog about ODRL, its story and its future, ODRL: A Path Well Travelled, a post authored by the working group co-chair, Renato Iannella, Monegraph.